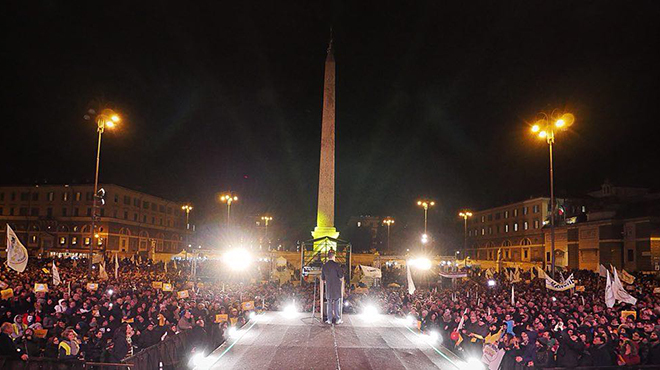 This is the summary of the contract for the government of change, signed by the 5 Star Movement and the Lega, the two political forces that won the last elections in Italy. They represent 17 millions of citizens. Please, don’t trust the mainstream media. Share this post! Protection of this common natural asset, as expressed in the 2011 referendum. Protection of agriculture, as well as support to small-scale fishing and Made-in-Italy products. Environmental sustainability through a “de-fossilized” and “de-carbonized” economy and nance; energy efficiency and renewable sources; support to a “green-economy”, (research, innovation and training for environmental development work); promotion of circular economy. Establishment of an investment bank for small- and medium-size businesses; protection of savings accounts; separation of credit and investment banks. Applicability of the notion of confict of interest in cases of interference between a public interest and another public or private interest that may influence the objective exercise of a public function, regardless of an economic advantage; application of statutory measures also for non-governmental positions. Conservation, enhancement and usability of cultural and artistic heritage. Reduction of public debt through GDP growth, rather than through tax- and austerity-based measures; revitalisation of both domestic demand as it pertains to high-multiplier investments and policies to support the purchasing power of households, and foreign demand, by creating better conditions for exports. Protection of Armed Forces personnel; hiring of new resources with increased equipment and tools; rationalisation of military spending, including in reference to the reclamation of decommissioned military real estate assets; review of international missions in relation to national interests. Membership to NATO with the USA as a privileged ally; openness to Russia to strengthen commercial relations; reorganisation of the diplomatic and consular network for Italians’ rights abroad. Freezing of VAT and excise taxes; Determination and simplification for households, businesses and VAT-registered professionals; review of the tax system applicable to natural persons and businesses; Flat tax at fixed 15% and 20% for natural persons, VAT-registered professionals, companies and families; provision for a fixed deduction of 3,000.00 based on family income; confirmation of the “no-tax area”; burden of proof on tax authorities; strengthening of compensations between credits and debts towards the Public Administration; abolition of the expense-based (spesometro) and income-based reporting systems (redditometro); enhancement of penalties for large-scale tax evaders; tax reconciliation: reinforcement of debt consolidation procedures. Independence of the Superior Council of Magistracy (SCM); separation of the judiciary – political careers; simplification and reduction of trials; enhancement of the right to self-defense; tightening of penalties for sexual violence; fair compensation for victims of violent crimes; crime expunction reform; end to de-criminalization and early release from jail; penalty increases for theft, robbery and fraud; speedy trials; class-action suits for citizens and businesses; reduction of costs to access justice; fight against poaching; construction of new prisons; new guidelines on the so-called “41-bis” prison reform (“hard prison regime”). Revision of the Dublin Regulation; compliance with the principle of fair sharing of responsibilities among EU countries; fast-tracking procedures for the veri cation of the right to refugee status; transparency of public funds for the immigration hospitality system; cooperation among countries. Introduction of minimum hourly wage; reduction of tax wedge and simplification of bureaucratic procedures; voucher system overhaul; enhancement of employment centers; fight against short-term employment and the effects of the Jobs Act; enhancement of training paths. Increased penalties for crimes against the Public Administration; debarment from doing business with or holding positions in the Public Administration for perpetrators and enablers of corruption-related crimes; introduction of undercover and inciting agents; strengthening of the National Anti-Corruption Authority; greater protection for whistleblowers; enhancement of wire-tapping, especially in cases concerning corruption; strengthening of crimes related to interactions between organized crime (Mafia) and politicians. Increase of funds for disabilities and individuals who are not self-sufficient; exclusion from the Indicator of the Equivalent Financial Situation (IEFS) calculation of welfare, social security benefits and indemnities; increase of civil disability allowance and adjustment to the social pension. Abolition of imbalances in the social security system introduced by the “Fornero Pension Law”, to facilitate the exit from the labor market of categories that are currently excluded; introduction of Quota 41 and Quota 100 pension reforms; separation between social security and assistance; extension of the “women’s option” measure. Policies to enable women to reconcile family and work duties. Increase of maternity allowance; tax benefits for businesses that keep mothers at work after the birth of their children; reimbursements for nursery and baby-sitting expenses, tax benefits including “zero VAT” for neonatal and child products. Benefits for families with dependent elderly, including home assistance through maids and caregivers. Employment-based supplemental income as support for Italian citizens for the purpose of job reintegration; the financial support amounts to 780.00 per month per person, de ned on the OCSE scale for larger families; the beneficiary of the income must accept job offers from employment centers (maximum of 3 proposals over a 2-year period); in the case of refusal, financial benefits will be revoked; investment of 2 billion Euro to reform employment centers. Minimum pension increase for those living below the minimum poverty line: supplement to pensions lower than 780.00 per month. Reduction in the number of parliamentarians; introduction of a mandate constraint for parliamentarians; strengthening of direct democracy; regional autonomy and provision of funds for local authorities; introduction of proactive referenda; elimination of quorum for revocation referenda; enhancement of legislative initiatives; transparency on the financing of foundations connected to political parties; evaluation of the performance of Public Administration managers; cutting laws streamlining of Public Administration. Increase of funds for the public health service; protection of regional autonomy in the organisation of health services; termination of the relationship between politics and the provision of health services; fight against waste, corruption and inefficiencies; review of pharmaceutical governance; Automation of the NHS and investments for prevention; reduction of wait on waiting lists. Review of teacher recruitment system; resolution of short-term teaching jobs; effective training system; introduction of tools that take into account the link between teachers and their area of residence; resolution of the “direct-call” system; continuous training for teachers; review of “school-to-work” programs. Increase of funds, tools and equipment; sta increase; renewal of contracts and career reorganisation; measures for fire fighters (stabilisation of labor relations, reinforcement of training and adjustment of wages to mirror levels set for law enforcement personnel); reorganisation of the Local Police with increase of equipment and tasks; rigorous fight against bullying and gambling; speedy eviction of illegal occupants and repatriation of illegals; investments in road safety; closing of unlawful nomad camps; fight against toxic bon res. Implementation of physical activities; provision and upgrading of sports facilities throughout the country; improvement of the operation of sports bodies; introduction of tax and contribution benefits for small amateur sports associations. 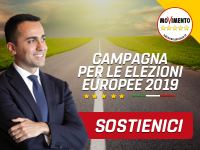 Definition of policies (support to income, pensions, investments, environment and protection of employment) to achieve Italy’s uniform development, and the reduction of the gap between North and South. Cuts to costs of politics, unnecessary institutions and privileges; retroactive equalisation of the social security system of parliamentarians, regional councillors, etc. to the social security system in force for all citizens; reduction of official vehicles, government-paid aircrafts and body guard services; reduction of golden pensions (above 5,000.00 Euro net monthly) that are inconsistent with social contributions paid. Reduction in the use of vehicles powered by diesel and petrol engines; incentives for hybrid and electric vehicles; National Infrastructure Plan to install electric vehicle recharging stations; strengthening of electric car sharing; development of urban and extra-urban bike trails; investment in resources to equip ports; modernisation and upgrading of railway lines; review of the project in the application of the agreement between Italy and France concerning the Turin- Lyon high-speed railway line; transparent management of public radio – television service lines; elimination of political cronyism and promotion of meritocracy in public radio – TV service. Creation of a Ministry of Tourism; abolition of tourism tax; tax credits for tourism businesses that hire young people; redefinition of ENIT (Italian National Tourism Agency) governance and its financial, economic and operational functioning. Review of European agreements (monetary policy, Stability Pact and growth, Fiscal compact, MES, procedure to balance excessive macroeconomics, etc. ); fight against counterfeiting and falsi cation of Made in Italy products; review of Italy’s contribution to the EU; opposition to CETA, MES China, TTIP and similarly inspired treatises. Increase of resources allocated to universities and research institutions; investments in innovation; elimination of waste; incentive of public-private partnerships that allow greater contribution of resources to research; expansion of student bracket that benefits from “No-Tax area”.